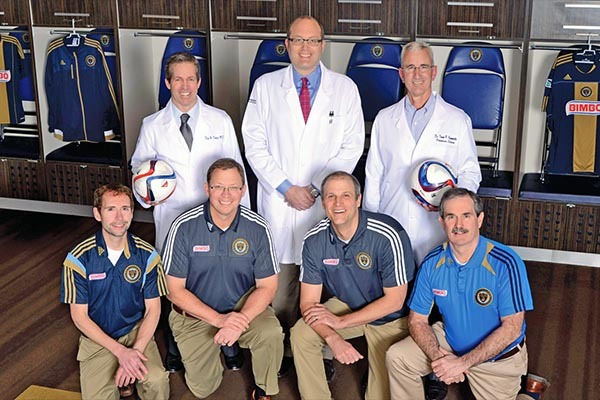 Crozer-Keystone Health System is proud to be the official health system and a founding partner of the Philadelphia Union. Our fellowship-trained sports medicine physicians provide expert care to the players on the Union. Additionally, the physicians of the Premier/Crozer-Keystone Orthopedics Partnership provide complete orthopedic care to the team. Front Row: Kevin DuPrey, D.O. ; Charles Hummer III, M.D. ; David Webner, M.D. and James McGlynn, M.D. Back Row: Dean Trevlyn, M.D. ; Craig Kriza, DPM and Frank Giammattei, M.D.